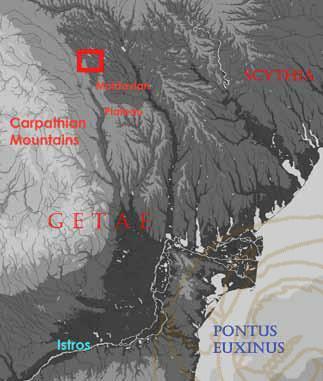 At the turn of the Early Iron Age to the east of the Carpathian Mountains (fig.1) flourished the ancient culture of the Getae. The Getic tribes built massive hilltop forts, some of them covering very large areas. The archaeological diggings uncovered complex fortification systems, as well as a large quantity of materials; the high number of amphorae is evidence of a strong commerce with the Greek cities of the Black Sea coast. Massive tumuli and impressive hoards attest to the level of power and prosperity attained by the local elites. More than 120 fortifications are known until this moment, located on the territories of modern day Romania, Republic of Moldova and Ukraine. In regard to their geographic positioning, it has been observed that they are grouped in certain micro-zones (Niculiţă et al. 2014, p.259) concentrated in river basins or at the border between the forest-steppe region and the steppe (Niculiţă et al. 2013, p.299). 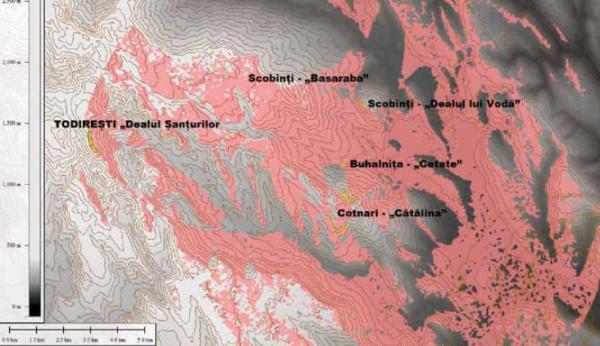 The area of Cotnari (fig.2) that we are going to discuss in our presentation is of particular importance. From a geographical point of view, the area is Located at the contact between the woodland areas of the Moldavian Plateau, with heights of more than 500m with the low steppes of the Jijia Plain. Here, a number of five forts are to be found clustered in a small area - amongst them the most important and spectacular is the one from Cotnari - „Cătălina”. During 1967 - 1985 archaeological diggings have been done by Adrian C. FLorescu at the fortress of „Cătălina”, with special attention given to the defensive system. Unfortunately, the findings have not benefited so far from an extended publication, due to the premature death of A.Florescu. The analysis and publication of these materials in the future should represent, from our point of view, a necessary priority. In the present paper we shall focus, however, on slightly different aspects. Taking into account the results brought in by recent aerial and satellite images, as well as the results of geomagnetic surveys, we shall attempt a preliminary discussion on the fortresses from the Cotnari micro-zone, attempting to better understand the functionality of this defensive system. The fortress of Cotnari is well known from the archaeological literature (Florescu 1971, p.109-111; Florescu 1980, p.12-14; Chirica and Tanasachi 1984, p.94-96; Zanoci 1998, p.127; Teodor 1999, p.145; Haheu 2008, p.68-69). It is located on a prominent hill near the commune of Cotnari and the village Horodiştea. Maximum elevation is about 380m, dominating with more than 200m the surrounding areas. Initially, only the smaller enclosure (A), around 4.5ha large, occupying the top plateau of the Cătălina Hill was known in the literature. The ramparts and ditches from the village of Horodiştea were considered part of another, distinct Getic fort (Chirica and Tanasachi 1984, p.100). However, more recent aerial and satellite imagery (Ştefan 1990) has confirmed that the fortresses of Cotnari- „Cătălina” and Horodiştea are in fact one and the same. Encompassing enclosure A from the Cătălina Hill is the much larger enclosure (B), having thus a total size of about 70ha. Unfortunately, much of the B enclosure is situated underneath the modern village of Horodiştea; subsequent interventions, from the Middle Ages as well as from the modern period, make difficult any attempt for further researches in this area (fig.3). A.Florescu concentrated its investigations primarily in the A enclosure, with a focus on the defensive system. The results were very interesting (see fig.5). The NW and NE sides are marked by slopes with an artificially accentuated incline. On the top of the two slopes was built a rampart with a base of 4-6 meters and a current height of 0.40-1m, having in the interior a stone wall about 0.60-0.80m high (Florescu 1971, p.110). The SW part of the rampart is the most spectacular. In order to prevent any slides, a number of stone walls had been erected at the base, stabilizing the 3m high rampart. Thus, the stone walls arranged longitudinally as well as perpendicularly formed a sort of „.skeleton” upon which a structure of wooden beams and earth was subsequently built. The same situation was also seen on the SE side of the A enclosure; however, here the rampart is doubled by a ditch, 23m wide and 6m deep (Florescu 1971, p.110-111). Although stone architecture is sometimes employed in other Getic forts, this kind of complex structure does not have until now any known analogy. In absence of diggings, the inner structure of the rampart encompassing the B enclosure is more difficult to ascertain. It is possible, however, that at least parts of it might have had in their turn a stone substructure (Chirica and Tanasachi 1984, p.100). The information regarding the structures of habitation existing inside the fortress of „Cătălina” is not numerous. Surface dwellings, as well as sunken ones, are mentioned in the archaeological reports. More data was brought in recently by the LIDAR (fig.6) and geomagnetic surveys (fig.7) made by the Arheoinvest Research Platform of Iasi. Thus, a scan of the entire area of enclosure A has been made. On the results of geomagnetic survey we can see anomalies in the south-central area that are due to modern interventions. There are, however, certain areas where we can see postholes, which indicate the presence of surface dwellings. But overall, the density of archaeological features does not seem great. In fact, there are entire areas inside the enclosure A that apparently have few (if any) archaeological features. The low density of archaeological features from „Cătălina” fort is not unique. At Stânceşti for example, but also at other fortresses of the Getae, the number of archaeological features found inside the enclosures is small (Florescu 1971, p.104). This situation has two possible explanations that are not mutually exclusive. First of all, the empty areas could have been used by the inhabitants for agriculture and domestic animals. It could have been useful to keep the food sources protected from any foe during times of constant raids and permanent military threat. On the other hand, it is also very likely that the purpose of these massive forts was to offer protection not just for the population and permanent garrisons Living inside, but also to the neighbouring villages and communities. Thus, in times of peril, the population of entire areas could find shelter in such forts. Benefitting from a large manpower, capable of defending the entire length of the walls, the forts could become very hard to conquer, except by a large and well organized enemy force. The chronology of the „Cătălina” fort begins sometimes in the beginning of the 4th century BC. The site continues to be used up around the 2nd century BC, but at this time the fortifications were no longer functioning. The abandonment of the defensive system happens most likely in the 3rd century BC, during the tumultuous events that lead to the downfall of the East-Carpathian Getae. The fortress of Buhalniţa is most peculiar, mainly because its location. 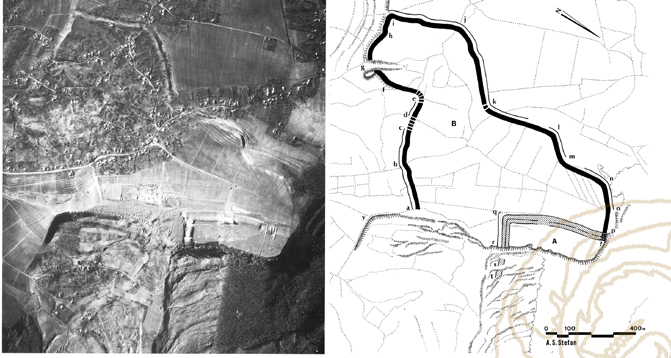 Situated less than 1km north of the „Cătălina” fortress, it is located in the middle of a valley, close to the Buhalniţa stream (fig.8), dominated in all direction by higher hills and plateaus (Zaharia et al. 1970, p.173; Florescu 1971, p.104; Chirica and Tanasachi 1984, p.72; Zanoci 1998, p.122; Teodor 1999, p.129; Haheu 2008, p.67). The shape of the fortress is oval, with the small diameter of about 128m. The size of the larger diameter can only be estimated, as the southern part of the fort was destroyed by landslides. The defences consist of a ditch and rampart, 3m deep, respectively 3m high, visible on the northern side. Located in the modern village of Buhalniţa, the fort was affected by modern day buildings and agriculture. No diggings have been done so far - however, a rich archaeological material has been found, most of it dating to the Getic period. Lacking a dominant position, the fort had most likely a local function, to control the access on the Buhalniţa stream as well as to defend against any attack on the northern flank of the stronger and more imposing „Cătălina” fortress. Interesting regarding its shape and size is the fortress of Todireşti - „Dealul ŞanţuriLor”, seven kilometers to the east of Cotnari – „Cătălina”, in a hilly region with heights of about 500m. The name itself is suggestive, as in Romanian it literally means „The Hill of the Ditches”. It was discovered by P.Nica, and later verified by a collective composed of V.Chirica, M.Tanasachi and Gh.Muraru (Chirica and Tanasachi 1985, p.401-402). The fort occupies a high, elongated ridge. It is delimited to the west by the Stolniceni stream, affluent of the Siret, and to the east by a series of streams, part of the Bahlui river basin. The altitudes are quite high for the Moldavian Plateau: 533m, dominating with almost 300m in difference the Lower neighbouring areas. The size of the fort can be approximated at about 850m in length and about 50 to 130 m in width (see fig.g). 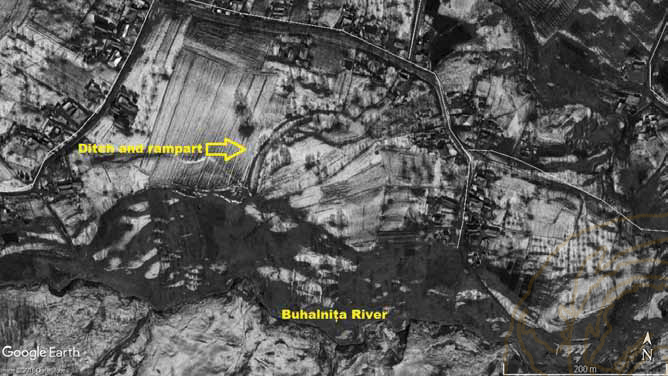 A number of five ditches with ramparts can be observed on the terrain four of them being clearly visible also on the satellite images. All of the ditches are oriented towards NNW. The first rampart is 2.50m tall with a 2m deep ditch. The second, located 300m behind it, presents a height of about 2.5m with the ditch 3m deep. The third is located 400m behind the second, and it is 2 meters high, with a 2m deep ditch. Close behind the third is a fourth one, barely visible on field and not visible on satellite images. 100m to the south is the fifth one, delimiting the fort to the south. It is badly preserved, only 0.50m high, with aim ditch (Chirica and Tanasachi 1985, p.401-402). No archaeological diggings have been done so far, but traces of burnt surface dwellings, as well as a number of potshards have been recovered. They date from the 5th-3rd centuries BC, but also from much older times (Cucuteni A3 phase). A dating of the defence systems in the Getic period seems, for now, the most plausible hypothesis. The complex system of defence with five ditches is similar to those found in Getic fortresses from the Republic of Moldova such as Butuceni, Rudi or Buhotin (Arnaut 2003, p.262). From a military point of view, the fortress of Todireşti could have been built to defend against an enemy attack coming from the north, as there was the only accessible way, from a military point of view. Lacking easy access to water, and located at a significant height, it must have been used as a refuge fort, and to control the existing trail roads between the Siret and Bahlui basin. It remains for future excavations to shed more light. Regarding the two fortresses from Scobinţi, the one from „Dealul lui Vodă” and the one from „Dealul Basaraba”, the existing information are very slim. No detailed plan or description exists. They are mentioned in the reports of A.Florescu (Florescu 1980, p.14), by other archaeologists (Teodor 1999, p.175), as well as in the local tradition. Also, a number of materials are mentioned as having originated from „Dealul lui Vod„”, including what likely seems to be the inventory of a Getic incineration tomb (Chirica and Tanasachi 1985, p.365). Unfortunately, during the 1970s, both areas were affected by intense landslides, due to deforestation. Part of the „Dealul lui Vodă” hill collapsed. 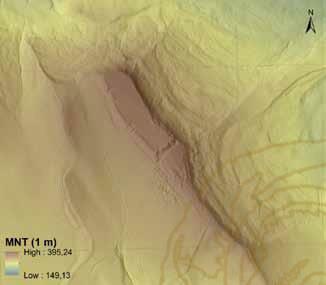 Fortunately, the analyses of the satellite images offer us the possibility to see at least the remains of this fort (fig.10). The fort, located at the summit, at an altitude of about 300m, seemed to have had a polygonal shape. 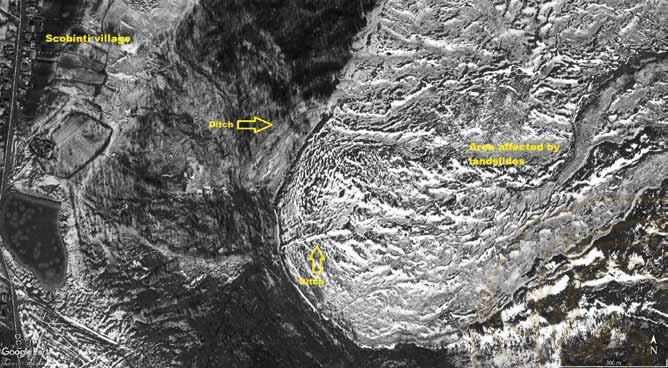 The contour of the ditches can be seen only on the western and southern part, the eastern part being completely ravaged by landslides. 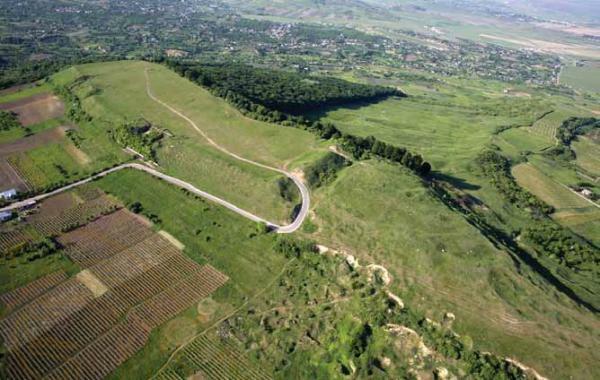 The analysis of the view shed of the Cotnari – „Cătălina” fortress offers us very interesting results. Thus it seems that all forts in discussion were visible from „Cătălina” and formed a coherent defensive system (fig.11). And in times of need, signals could be sent from one point to another, easing the defences. Similar centres of power, consisting of multiple, mutually visible fortifications, are well known in the Getic world, for example, in the Saharna region on the banks of the Dniester (Niculiţă et al. 2014, p.261-262; Niculiţaet al. 2015, p.21-46). The ingenious system of „stone wall skeleton” used for the rampart in the A enclosure of „Cătălina” fort shows that the builders of these forts had at least some empirical knowledge of engineering. It is difficult to say whether we are dealing with the work of an architect coming from the Greek world or simply a local innovation. Its complexity might give credibility to the first hypothesis; its uniqueness might point to the latter. Nevertheless, the massive ramparts, ditches, and defensive works testify to the prestige and power of the local rulers who were able to recruit a large workforce and also qualified individuals. The building and maintenance of these forts imply the participation of entire communities. The Moldavian Plateau does not offer many natural resources, except for salt; metal has to be brought from the Carpathians, or from further east. However, there was plenty of wood to be found in the forests, as well as good agricultural fields. A large number of agricultural tools, as well as carbonized grain seeds were found during the diggings in the „Cătălina” fortress (Florescu 1980, p.14,17). They attest that agriculture was one of the main occupations of the local population. Another source of revenue would have been trade. Located between the Siret and Bahlui/Prut river basins, the area benefited from access at two major commercial roads that went upstream on these two tributaries of the Danube. The large numbers of amphorae attest to a constant flow of trade with the Greek and Hellenistic world. It remains for future archaeological investigations to offer us more detailed information about the life of those who built and found shelter in these forts. In a period marked by constant low-intensity military conflict between tribal factions, but also by consistent external threats, such as Scythian raids and later attacks from Bastarnae and other warrior tribes, the forts from Cotnari area provided an element of stability and a place of refuge for the local population, until their eventual demise somewhere at the end of the 3rd century BC. We thank Dr. Andrei Asăndulesei (Arheoinvest Iaşi) and conf. univ. Dr. Vasile Cotiuga (Alexandru Ioan Cuza University of Iaşi) for granting us permission to use the results of the geomagnetic and LIDAR scan of the Cotnari-„Cătălina” fortress. Figure 1. Map of the East-Carpathian lands with our area of interest - the Cotnari micro-zone. Figure 2.The fortresses from the micro-zone of Cotnari. Figure 3. Aerial photo and plan of the two enclosures of the Cotnari-„Cătălina” fort (after Ştefan 1990). Figure 4. Aerial image of the A enclosure from Cotnari-„Cătălina” fort (Arheoinvest Iaşi). Figure 5. The stone wall substructure of the rampart in the enclosure A at Cotnari-„Cătălina” fort (after Florescu 1980). Figure 6. 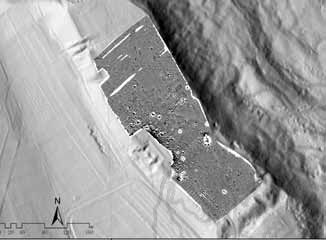 LIDAR scan of the Cotnari-„Cătălina” fortress, with a focus on enclosure A (Arheoinvest Iaşi). Figure 7. Geomagnetic survey of the A enclosure from Cotnari-„Cătălina” fortress (Arheoinvest Iaşi). Figure 8. The fortress of Buhalniţa (Google Earth). Figure 9. The fortress of Todireşti (Google Earth). 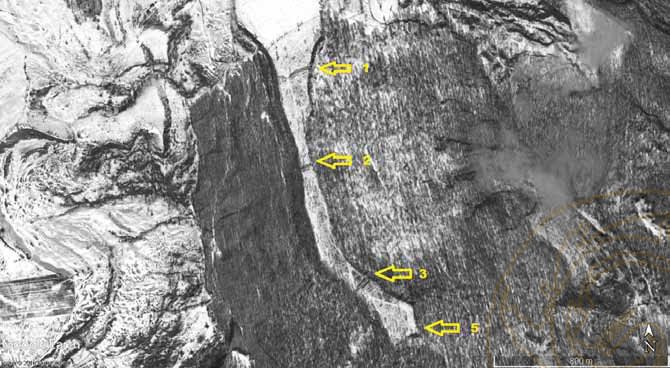 The yellow arrows mark the ramparts visible on satellite imagery and their corresponding number. Figure 10. The fortress of Scobinţi – „Dealul lui Vodă” (Google Earth). Figure 11. View shed analysis for Cotnari – „Cătălina” fort. • Arnăut, T. 2003, Vestigii ale sec.VII-III a.Chr. în spaţiul de la Răsărit de Carpaţi, Chişinău. • Chirica, V. and Tanasachi, M. 1984, Repertoriul Arheologic al judeţului Iaşi, vol.I, Iaşi. • Chirica, V. and Tanasachi, M. 1985, Repertoriul Arheologic al judetului Iaşi, vol.II, Iaşi. • Florescu, A. 1971, Unele consideraţii asupra cetăţilor traco-getice (hallstattiene) din mil. I î.e.n. de pe teritoriul Moldovei, în Cercetări Istorice, II, p.103-118. • Florescu, A. 1980, Aspecte noi privind fortificaţiile traco-geto-dace din a doua jumătate a mileniului I î.e.n. descoperite în Moldova, în RMMIA, 1, 11-18. • Haheu, V. 2008, Sisteme de fortificaţii traco-getice la est de Carpaţi, Academia de Ştiinţe a Moldovei, Institutul Patrimoniului Cultural, Chişinău. • Niculiţă, I., Zanoci, A., Bat, M. 2013, Fortified Settlements of the 6th-3rd centuries BC in the Southern part of the Middle Dniester, p.299-323, in Semper fidelis: In Honorem Magistri Mircea Ignat, Istros, Brăila. • Niculiţă, I., Zanoci, A., Bat, M. 2014, Administrative, religious and cult centres in the East-Carpathian area during the 2nd half of the 1st millenium BC, in Mousaios, XIX, p.259-276. • Niculiţă, I., Zanoci, A., Bat, M. 2015, Thraco-Getic fortifications in Middle Dniester region. Sites from Saharna micro-zone, p.21-46, in Fortified sites from the 1st millennium BC in Central and South-Eastern Europe, Chişinău. • Ştefan, A. S. 1990, Les Fortifications du premier Age du Fer de Cotnari (Departement de Iassy, Moldavie, Roumanie), in Photo Interpretation, 90-6, p.45-49. • Teodor, S. 1999, Regiunile est-carpatice ale României în secolele V-III d.Hr., Vavila Edinf SRL, Bucureşti. • Zanoci, A. 1998, Fortificaţiile geto-dacice din spaţiul extracarpatic în secolele VI-III a.Chr., Vavlia Edinf SRL, Bucureşti. 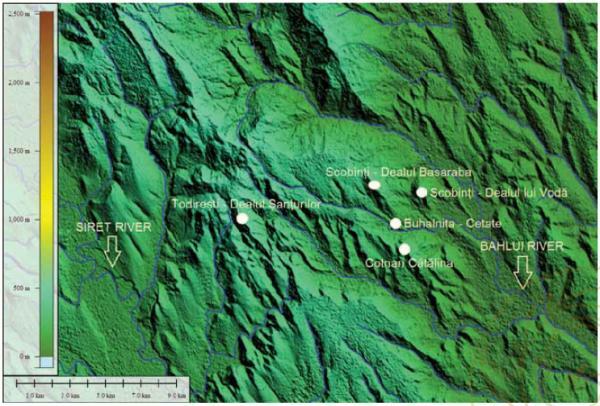 The present paper analyses a cluster of five Getic fortresses in the area of Cotnari (Iaşi County, Romania). The most important is the one of Cotnari-„Cătălina”, covering a total surface of about 70ha. All other forts are in its view shed. The cluster of forts represents a defensive system built at the contact between the hilly woodlands of the Moldavian Plateau with the Jijia plains. The diggings of 1970's and more recent geomagnetic scans show that the fortress of Cotnari-„Cătălina” was not intensely inhabited, its purpose was to serve as a refuge for the neighbouring populations.